I've always enjoyed an Indian Pale Ale, so when I saw that Cooper had an Australian Pale Ale, I wanted to try making it, especially as I have enjoyed the commercially bottled product. However, it claimed that it wanted "Brew Enhancer #2" (actually just a mix of dextrose, malt, and maltodextrin) which took me a while to find. 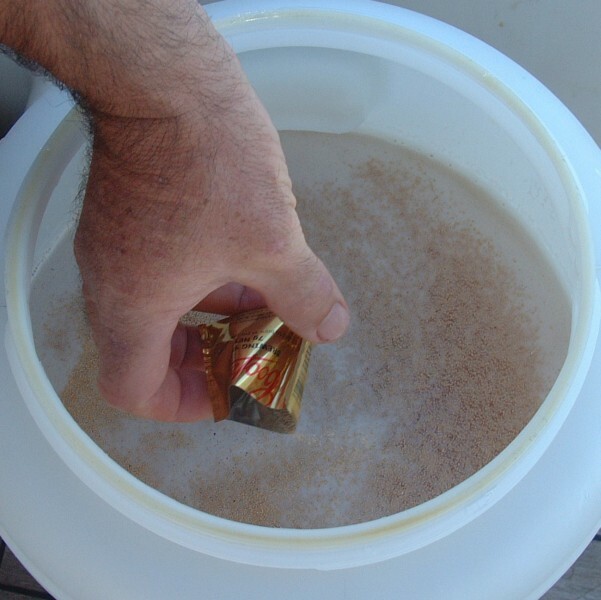 Also, now that we're away from civilization (we're currently anchored at Great Keppel Island off the Queensland coast) this will be my first attempt at brewing entirely on board, without shore support (like unlimited fresh water). This first stage of preparation doesn't actually require much water. The fermenter, its top, tap, water-trap, and 2 large mixing spoons were gathered together on the aft-deck. First they were cleaned with some brewers detergent (not hard as everything was essentially clean already), rinsed, and then sterilized with some Sodium-metabisulfite and rinsed again. All this was done in the carboy, using the shower on the sugar-scoop, which actually made it easier than, say, the laundry at the Brisbane Pilings. 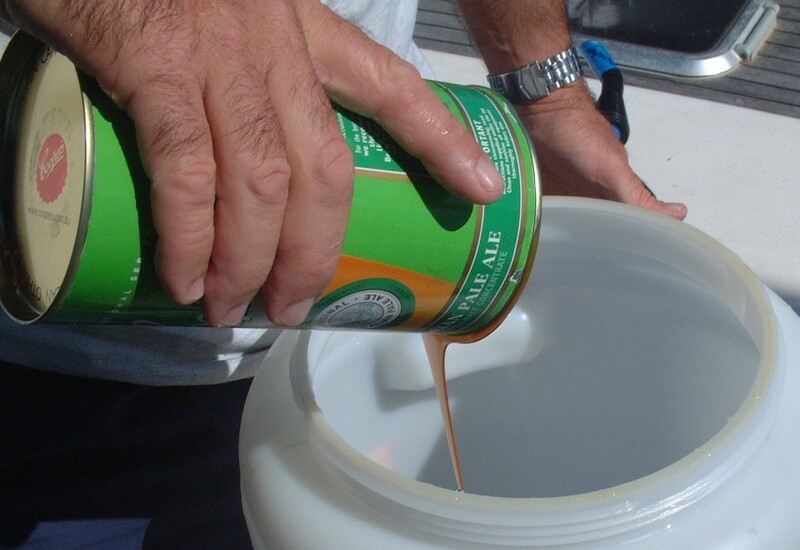 The can of malt-extract ("best before" dated January 2008) was opened and poured into the fermenter. After spooning out as much as I could, I added about a cup of very hot water to dissolve the rest of the malt-extract and poured it into the fermenter as well. The 1Kg bag of Coopers "Brew Enhancer #2" was added as well as another 3-4 cups of hot water. (My cool water is now cool enough that I can use hot water for this early dissolving step, which I couldn't do before.) The mixture was stirred and cool water was added until I had 23 liters in the fermenter. Initial Specific Gravity was measured at 1.040, the yeast was sprinkled on top of the wort, and the cover and water trap were fitted. Although the mix was at a fairly ideal temperature of 75°F (24°C) the nights have been cool so I decided to leave the wart in the sun for the afternoon, but brought it inside when temperatures cooled off later. It is so nice to come below and hear the yeasties quietly turning water into beer, as they blub-out CO2 through the water-trap. Every time we step below, the slight movement releases a bubble. This batch started bubbling after only 10 hours, which is fairly fast compared to my previous batches. Unfortunately, now that we're in warmer weather, the fermentation process continued a bit faster than I would have liked. I prefer the fermentation to proceed at a modest pace for a week or so, but this batch had finished bubbling after only 2 days (although some fermentation continues, as the specific gravity continues to fall after the bubbling stops). Several people I've talked to say that a longer initial fermentation seems to produce a nicer tasting beer. All of my previous batches suffer from rather light carbonation. There's a (small) hiss when I open a new bottle, and I even get a (small) head when I pour. A glass stays lightly fizzy until finished (sort of like a British or some European beers) but they're nowhere near as carbonated as most beers. This is actually rather pleasant to drink (not too gassy) but an opened bottle tends to lose its carbonation after only a few days in the fridge. The bottles seem relatively tight when warm, but they're not nearly so pressurized when they're cold. This is to be expected, but comparing their pressurization to, say, a bottle of soft-drink, I can see that I can carbonate my beer quite a bit more than I have been without the risk of bursting a bottle. Some people prime with straight CO2. This lets them enjoy their beer almost immediately, as they don't have to wait for that fermentation step, but I don't have a bottle of CO2 (or a large pressure vessel, like a keg) handy. 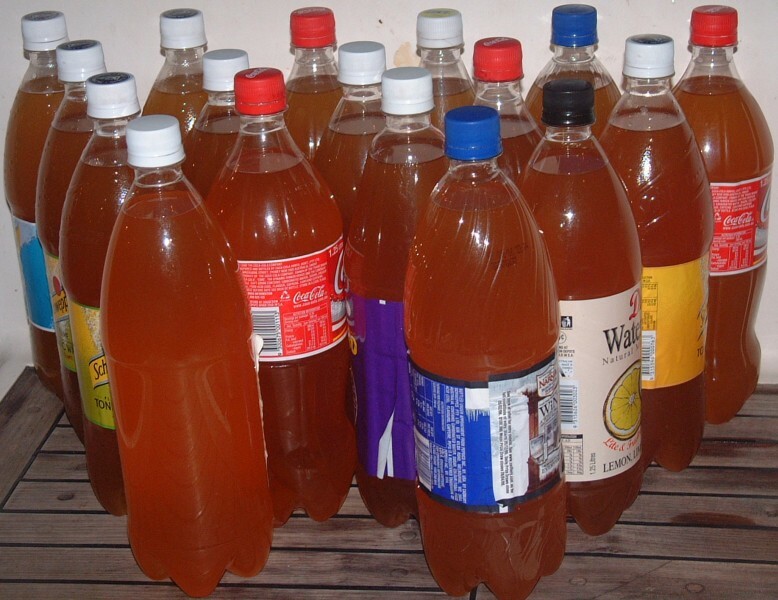 One thing I can do to increase my carbonation is to increase the amount of sugar added to the bottles for the carbonation (priming) stage. The question, of course, is "how much?" I eventually decided to start small and only increase the sugar content by 20%. So I cleaned and sterilized 20 1.25 liter bottles but then had Amanda (my bottle dosing expert) dose them with enough dextrose for 1.5 liters. For one reason or another, I was only able to harvest 17 bottles, or a bit more than 21 litres (52 cans) worth of beer. Like many homebrews, this one has a nice honey color, not the pale, almost transparent yellow of bought beer.